Influenza (the flu) is a contagious respiratory illness caused by influenza viruses that infect the nose, throat, and lungs. Flu can be serious. Most people who get flu will just feel sick, but some will experience severe illness, and even death. Even healthy people can get the flu. The Centers For Disease Control and Prevention (CDC) and WCHD recommend that everyone 6 months and older get a flu vaccine each year. Can't make it to your primary care provider? Use the Flu Vaccine Finder to find clinics and pharmacies near you offering flu vaccine. Provides influenza vaccine to Winnebago County residents. Frequently wash your hands with soap and warm water. See the handwashing guide below to learn how to best wash your hands to prevent the spread of germs. Sometimes stomach symptoms, such as nausea, vomiting, and diarrhea, can occur but are more common in children than adults. 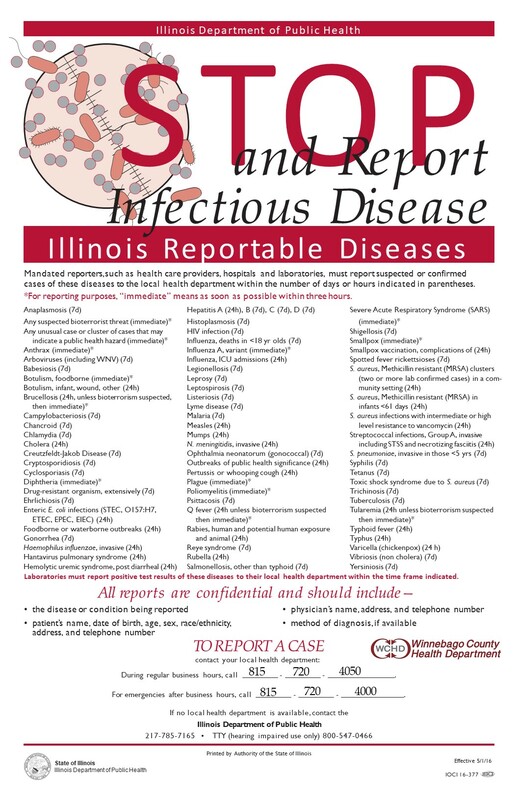 In Winnebago County, our healthcare providers are asked to report positive tests for influenza using this reporting form. The Winnebago County Health Deparrtment maintains a repository of influenza reports issued by season. Click on a season below to view influenza reports issued that season. The Health Department has confirmed cases of Shigella in the community. Please click on the links below for more information. Centers For Disease Control and Prevention (Handwashing Video) - "Put Your Hands Together"